Jacob Cordover and Laura Karney bring together the diverse elements of the oboe/cor anglais and guitar in their unusual partnering. Zoco Duo has been heard in concert in Australia, China, Canada, England, France, Germany, Italy, Spain and the USA; including performances at the Leicester Festival (UK), Festival Internazionale del Coros (Sardinia, Italy), the Festival de Musique Classique (Midi-Pyrénées, France), Music By The Sea (Bamfield, BC, Canada), and String-139 Festival (Beijing, China). The Spanish derivative of the Arabic word for souk or bazaar, a zoco was a place where a myriad of sights, sounds and smells of the exotic mingled. It is a crossroad where merchants and travellers from all over would meet to sell goods, socialize and exchange news. 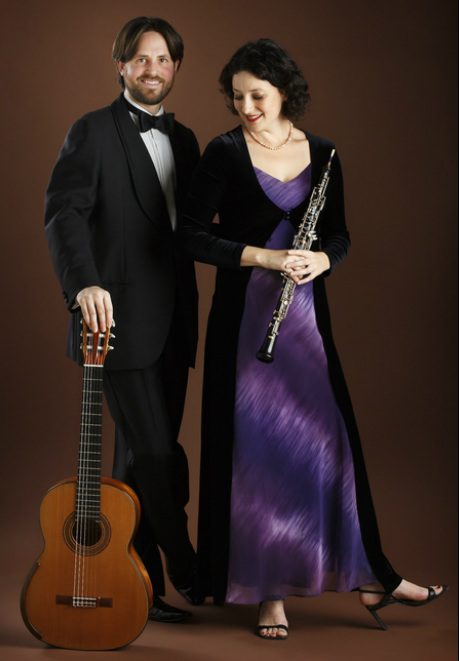 It is in this spirit that the guitar and oboe /cor anglais come together, merging their individual sounds to play a wide range of musical styles - from Baroque to Contemporary, Europe to the Americas, Zoco Duo creates an experience full of exotic sounds, musical textures and evocative atmospheres. The pair met whilst Artists in Residence at the Banff Centre for the Arts in Canada, and in this setting they first performed together. The scarcity of repertoire originally written for this combination of instruments has meant that many of the arrangements have been done by the duo themselves. Inspired by their belief in the development of classical music and the further exploration of musical possibilities this combination offers, Zoco Duo has commissioned and premiered several works by both up-and-coming and well-established composers and continue to perform a variety of contemporary works. Over the years Zoco Duo has worked with specialist Carlo Barone and studied the historically informed style and performance practice of early nineteenth century works inspired by bel canto era Italian opera. Applying the bel canto vocal traditions to early nineteenth century instrumental music, Zoco Duo have helped audiences to rediscover the excitement and drama of instrumental music inspired by Italian Opera. Mr Cordover received his formative training in the classical guitar with Timothy Kain at the Australian National University School of Music and subsequent post-graduate studies at the Escola Superior de Música de Catalunya and the Escola Luthier in Barcelona, Spain. Ms. Karney completed her undergraduate studies in oboe under Richard Killmer at the Eastman School of Music in New York and post-graduate studies with Nicholas Daniel at the Hochschule for Musik in Trossingen, Germany. Coinciding with the 10th anniversary of their first performances together, Zoco Duo released their debut CD through Cala Records in 2014. Receiving rave reviews and attention, Historias has been featured on radio programmes in Australia, the USA and Taiwan. Whether capturing the haunting and mournful quality of Rodrigo’s Spanish songs, the sultry precision of the Argentinian Tango or the virtuosic excitement and drama of Mauro Giuliani’s potpourri of Italian Opera, Historias illuminates the remarkable versatility of this unique pairing through thoughtful arrangements of both well-loved classics and unknown gems.